Tsunami: 400,000 Dead In Indonesia ? ... Official Count: 135,000+ ... Ghana government's response - SILENCE? ... Aid on the Web: How to help | Huge aid effort KUALA LUMPUR, Dec 30 (Bernama) -- The death toll in Acheh, the region worst hit by last Sunday's tsunami, may exceed 400,000 as many affected areas could still not be reached for search and rescue operations, Indonesia's Ambassador to Malaysia Drs H. Rusdihardjo said Thursday. He said the estimate was based on air surveillance by Indonesian authorities who found no signs of life in places like Meulaboh, Pulau Simeulue and Tapak Tuan while several islands off the west coast of Sumatera had "disappeared". He said the latest death toll of more than 40,000 in Acheh and northern Sumatera did not take into account the figures from the other areas, especially in the west of the region. "Aerial surveillance found the town of Meulaboh completely destroyed with only one buiding standing. The building, which belonged to the military, happens to be on a hill," he told reporters after receiving RM1 million in aid for Indonesia's Tsunami Disaster Relief Fund here Thursday. 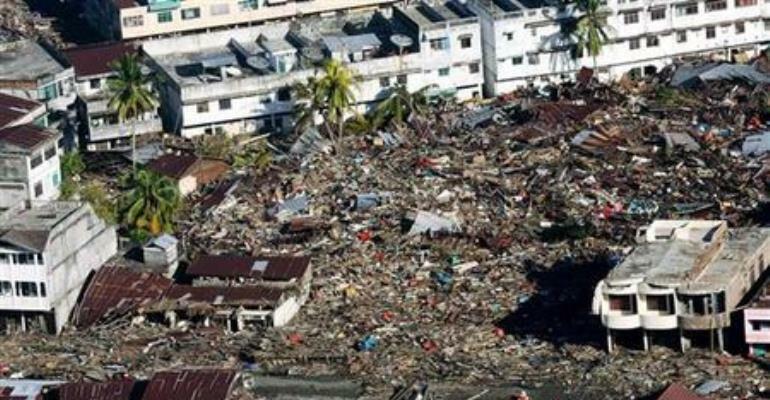 Rusdihardjo said there were about 150,000 residents in Meulaboh, which was located 150km from the epicentre of the earthquake while Pulau Simeuleu had a population of 76,000. Ambassador Rusdihardjo said a combination of earthquake and tsunami had left 80 to 100 per cent of infrastructure in Acheh province, such as hospitals, health centres, transport and communication networks and homes, destroyed. "Looking at the scale of destruction, it's difficult to say when the search and rescue operations can be mounted in all affected areas," he said. He said rescue efforts were hampered by transportation difficulties and lack of fuel. Rusdihardjo said that at this time international help, especially in the form of medicines, clean water, food and clothing, were desperately needed by Indonesia to aid survivors in Acheh. "Now we are worried about the outbreak of diseases such as cholera, the work of disposing corpses and the absence of clean water following the contamination of water sources," he said. It would take years before the situation returned to normal, he said, adding that the Indonesian government was not able to estimate losses caused by the tragedy as yet. He expressed his gratitude to Malaysia's help although the country itself was hit with 66 lives lost so far and property to the tune of millions of ringgit destroyed. "We are deeply touched," he said. Rusdihardjo said Indonesia was also seeking Malaysia's cooperation to mount search and rescue operations from its shores because of the close proximity of the two countries.